Most of us can credit some of the best nights of our lives to a turntable operator. However, after a seamless set, how many of us thank the Dj who harnessed the sounds? A skilled Dj is a symphony conductor; synthesizing the perfect blend of music to stimulate the right mood, at the right time. I can personally attest to Dj Dozen’s finesse on the tables; and chances are you’ve enjoyed his vinyl concoctions. In light of all the heads nodded and sweated out curtesy of Dj Dozen I thought it was time to get acquainted with the mind behind the mixers and let me tell you; his thoughts are moving faster than fingers on vinyl. Follow him on Twitter @djDOZEN or visit djdozen.com; don’t miss any of his mixtapes dropping this summer. Demi: How long have you been Dj’ing? Dj Dozen: I started Dj’ing when I was 15, almost a decade in now. Tell us a bit more about your position with D.O.P.E Game. Dj Dozen: I use my position as one of the more social elements to reach out to other artist and bring exposure to the movement. Konsequence and I do a lot of work with others just because of our skill set and that has made it easier to collab and get good music done. Do you think Dj’s get enough credit/acknowledgement in the music community? Dj Dozen: Yes and no. People who really enjoy music always show a lot of love, BUT in the day of this digital technology our skill set sometimes gets taken for granted; like we’re big IPods or juke boxes but we’re not. Dj’s have an opinion and analytical skills to rock a crowd, sometimes people wanna put us into a box and play cookie cutter music but that’s not what I’m about. What would you like to see change in regards to the perception surrounding Dj’ing? Dj Dozen: The only thing I’d like to see change is people coming out with an open mind; ready to jam to the unexpected and leave the inhibitions at home. Nobody cares if u can’t dance, I wanna see that “we ain’t gonna remember this tomorrow, lets party” feeling. Oh and support people doing good QUALITY performances, hold these artist n Dj’s accountable. As a Dj what you do you think your most important role is? 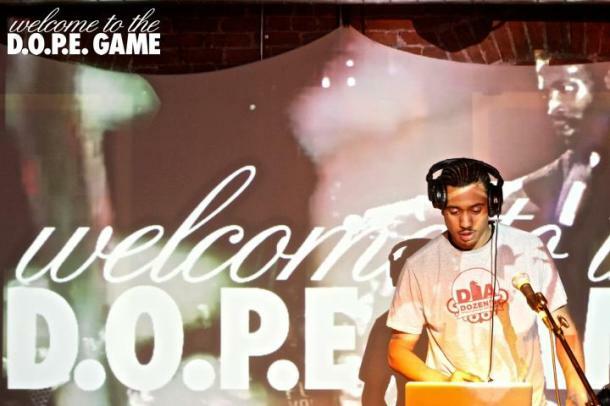 Dj Dozen: Set the atmosphere for what ever occasion it may be. If it’s a party-inspire folks to jam, if it’s a groove thang-feed em something to groove to, and if it’s a sit down function-blow their minds! What’s your niche on the tables? Dj Dozen: I jam, I don’t play music that I don’t enjoy, no matter what genre it may be. So if u ever see me actively mixing you’ll notice my eyes are closed and I’m smiling cuz I’m just having a good time and the vibe gets contagious. Dj Dozen: That I have currently it’d have to be my Technics, since I started on vinyl. My Sennheiser Headphones (you gotta be able to hear what you doing) I just bought a MPC 2000 that I’m rebuilding from scratch so I’ll have some fun with that. Although I enjoy vinyl WAYYYYY more I like my Serato hardware/software. Technology saved me years of back pain lugging around crates. How do you feel when you’re on the tables and people are turning up to your set? Dj Dozen: I feel like Ric Flair…like WOOOO! I feed off people’s energy if there’s a packed house in front of me I’m trying everything I can to impress them. I want to make them break a sweat, shake their hair, jump around…and I’m right in there with them! Do you make beats as well? Dj Dozen: Yea that has just started becoming one of my main focuses; engineering has been more of my thing but the DOPE Game is DEEP on the production side. I’m inspired to go harder in the lab because I have all these DOPE producers around me. Dealz will MAKE me sit down n make a beat; him and Jones, Black Jordan, Jay Spydatek, Fat Tracks, Mo $, Yung Tru, Big Beats Mccree & Big J definitely inspire me to be DOPE’er. What event or artist do you dream of Dj’ing for? Dj Dozen: I’d LOVE to rock SXSW one time. I want to do the Paid Dues Festival, the Do-Over in LA, any local big music fests in Colorado. As far as artists go, Killer Mike, Add-2, Turner Jackson, Curtis King is dope too. Ultimately though I see myself doing something like Dwele; I’m an R&B head. Dj Dozen: Positivity, TMZ stories, babies mommas. Uhhh oh u mean musically, Ace 2 Spacey of Urbane Society is hosting the next DOPE Game tape, dropping here in the next few weeks. In June, Yung Tru is dropping a sample pack and beat tape. I’m working on a new project by LoveLady and getting in the lab with my boy Chuck T. Spydatek and myself have something cooking up. The SQUAD as a whole is working on this collaborative DOPE Game project. Turner Jackson and I are doing a monthly hip hop open mic on Thursdays at Funky Buddha starting April 11th. I’m doing ANYTHING Jeremy Pape puts in front of me to do. I missed Valentine’s Day for the Get Right so I’ll be dropping it here soon for the slow jam lovers. I have a new summer mix, a 90’s series called “Ashley Mixes” and a workout mix. I’m just working in general! I’m doing mixing, duplication, and hosting deals all summer so anybody dope should holla at me. I’m ready to work.